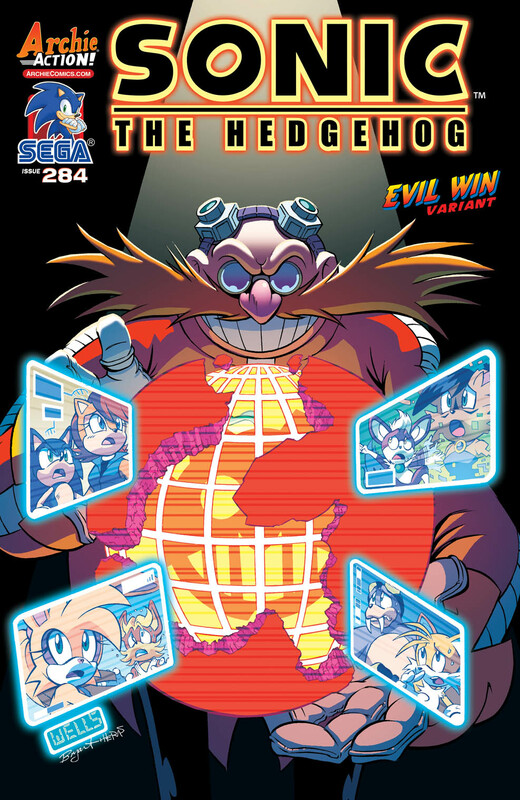 Archie Comics is ending the "Shattered World Saga" in the Sonic the Hedgehog comic book series. That ending will come right in time for the brand new arc in Panic in the Sky which will kick off in Sonic the Hedgehog #284. The issue will be written by Ian Flynn and illustarted by Diana Skelly, Terry Austin, John Workman and Gabriel Cassata. The issue will also feature the first of four connecting covers by Dan Schoening and an "Evil Win" variant by Lamar Wells. Sonic the Hedgehog and friends have finally collected all the necessary tools to restore their broken planet which was shattered at the hands of the evil Dr. Eggman. But Eggman's not about to let Sonic fix his planet without a fight, as he unleashes a devastating and epic assault on the Freedom Fighters. He has a plan of his own and strikes first. The mad doctor launches a multi-pronged assault that will leave you speechless-everything has been building up to this moment. AN EPIC THREE YEARS IN THE MAKING! THE LONGEST RUNNING VIDEO GAME COMIC SERIES OF ALL TIME CONTINUES! The SHATTERED WORLD SAGA comes to a close as the fate of the world hangs in the balance! PANIC IN THE SKY begins this summer as Sonic the Hedgehog and friends have finally collected all the necessary tools to restore their broken planet which was shattered at the hands of the evil Dr. Eggman! But Eggman's not about to let Sonic fix his planet without a fight, as he unleashes a devastating and epic assault on the Freedom Fighters! The past three years of SONIC THE HEDGEHOG comics have all been building to this moment! Don't miss the epic finale to one of the biggest events in Sonic comics history, coming your way this summer from writer Ian Flynn and artists Diana Skelly, Terry Austin, John Workman, and Gabriel Cassata. PANIC IN THE SKY kicks off in SONIC THE HEDGEHOG #284, available incomic book shops and on the Archie Comics App.